JD's work took us out to dinner last night - fantastic Spanish - yummy tapas. 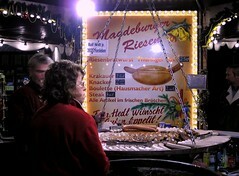 And before that we stopped byt he Xmas Market. I couldn't believe some of the guys with us had one of these first. How disgusting knowing you'd be eating a real meal very soon. The Gluhwein went down well, this time I had it without the shot of rum and so it was much nicer and I didn't feel drunk within seconds. is that some kind of hot dog? hot dog before spanish food? come to think of it a hot dog before anything? what were they thinking?!?!?! ?